If you decide installing your tub inside the house, remember that spas produce lots of humidity and heat. Besides, while the tub is guaranteed not to leak given correct installation, there will be some leakage during the first few weeks or more while the staves expand to form a full seal. Therefore you most likely need a special room with a proper drainage and ventilation to avoid damaging the walls, floor and celing. Sometimes you may need to add more structural support to the existing floor as tub filled with water and bathers together can weigh way over 2 tons. Think about the overall cost wheather this is within your household budget. 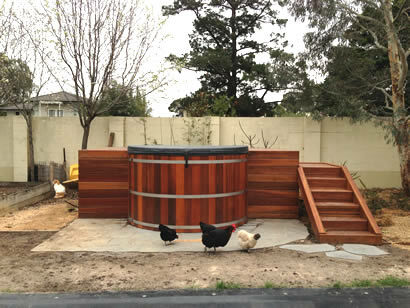 A firm, stable, level foundation is a MUST for all hot tubs. 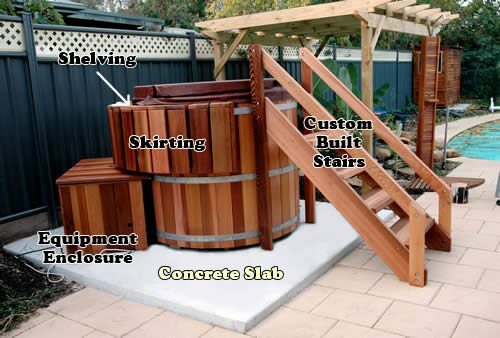 You can place your tub on to concrete patio blocks, re-inforced concrete slab or reinforced deck (consult with your builder to ensure the deck will hold full weight of the tub with water and bathers). Tub foundation should be somewhat larger then the actual diameter of the tub for placing tub equipment. 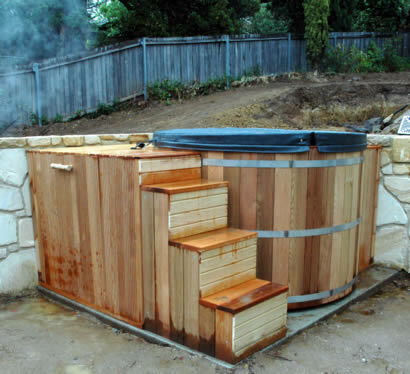 The pump, heater and filter should always be located at or below the level of the floor of the hot tub and should be accessible for routine maintenance. 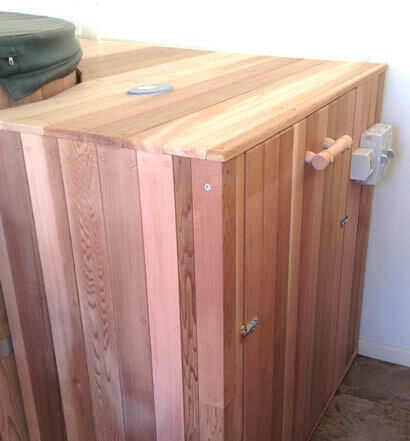 The stand alone tub presents the least problems with accessibility and the pump, heater and filter are located adjacent to the tub. In this case you will wish to have the foundation pad larger on the side where this equipment will be positioned (approximately 900mm). Custom built equipment enclosure, stairs, shelves and skirting are available from Ukko Tubs. If you are using a custom built enclosure do a test fit first before locating your equipment as the enclosure will dictate the positioning of the equipment base. In case of fully enclosed tub installation, we strongly recommend to install tub first (it will save you lots of troubles later on when connecting equipment and glueing plumbing) and then build framework and enclosure after. In case of recessing your tub in to the soil, you need to make tub foundation larger than the actual diameter of the tub. Pit walls where tub is located must be concreted or tiled to avoid soil movement. Proper drainage must be considered to divert rain water out of the pit. Spa equipment needs to be on the same level as the tub suction. If you are considering buying gas (or wood fired heater), you need to allow extra space for its positioning (not exceeding 3m distance from the tub). Gas, heat pumps and wood fired heaters must have enough space around them and cannot be enclosed or placed under the deck. 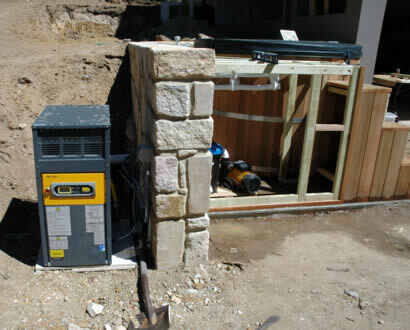 Always consult supplied manuals and certified plumber for the best possible position for the gas, heat pump or wood fired heater. Failure to do it properly may result in voiding heater warranty and heater not operating properly. 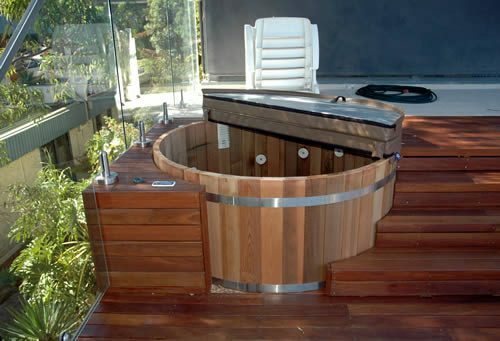 Installing your hot tub into or on a deck is the choice of many Ukko customers. It provides the most esthetically pleasing and practical installation. Normally you would want your deck adjacent to or at least close to the home making access to it quick and easy. 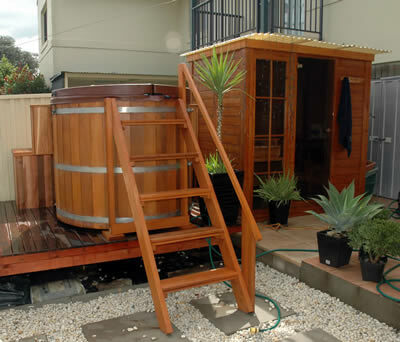 Some owners prefer to locate their tubs so that they can take advantage of the property views. There are endless possibilities for deck installations. You are only limited by your imagination. 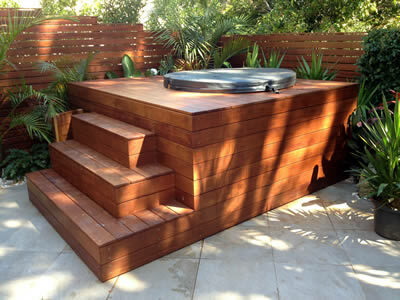 Three main tub locations are generally on the deck, recessed full down or partially in to the deck. The support structure of the deck must be able to handle the weight of the filled tub with a safety margin. Always check your local building codes as they can be helpful and may govern your deck design. 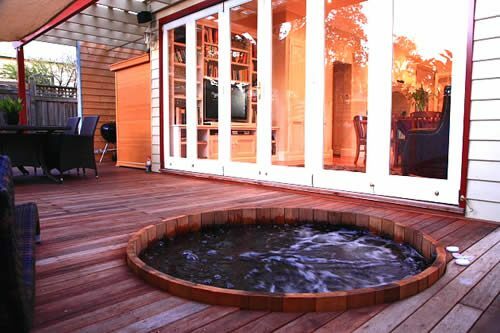 If the tub will be built into a deck, the pump/control unit is typically placed at a convenient location under the deck. Simply ensure that the pump/heater/filter assembly remains accessible and that you have taken measures to ensure the pump and control unit will remain completely dry when considering rain or spillage. 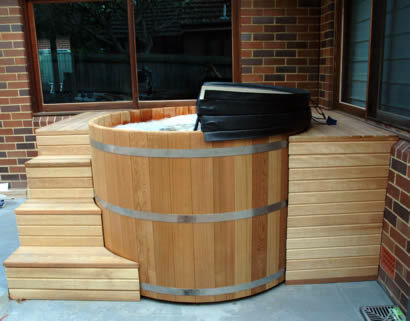 You should do the assembly of the tub first in an open space and be confident you have achieved a good tight fit before you lift the tub into its final position and surround it with deck boards. Also carefully consider how to access plumbing after the deck boards are all in place (i.e., provide working space). 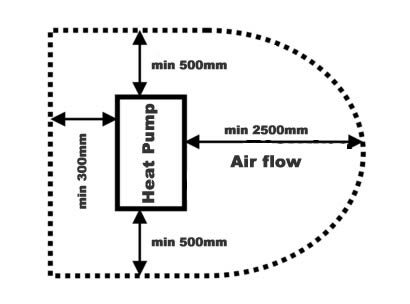 In order for the insulated cover to fit, it is recommended that the base be designed so that the staves remain at least 60mm above the deck floor. In this case you will need to devise some system to allow the cover’s tie-down straps to be secured. In partially recessed tub installation, you may consider building Cedar shelving and skirting around the plumbing for the best eye pleasing look. 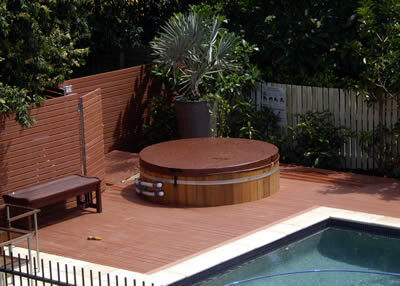 Ukko can manufacture any custom sized shelving and skirting to match your deck/tub design. If the deck is low, you may need to build a hatch into the deck to allow filter changes and access to the tub equipment. For more assistance in designing your tub project simply contact us. We are here to help!